Divorce laws in England and Wales are to be overhauled so couples can split faster and, it is hoped, with less acrimony. Under current rules, one spouse has to allege adultery or unreasonable behaviour by the other for divorce proceedings to start straight away. In future, they will only have to state that the marriage has broken down irretrievably. It will also stop one partner refusing a divorce if the other one wants one. Justice Secretary David Gauke said the changes would help to end the "blame game". Currently, "fault-based" divorces, where there are allegations of adultery or unreasonable behaviour - can take as little as three to six months. 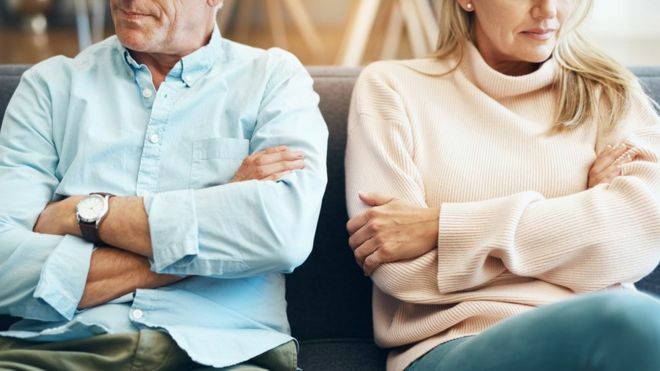 But "no-fault" divorces can take much longer - with couples having to prove they have been living apart for at least one year in Scotland, and at least two years in the rest of the UK. Living apart can include living in the same house, provided they are not sharing a bed or living as a couple. Should it be easier to get a divorce? Mr Gauke told BBC News: "Frankly, we are not going to keep marriages together by having a divorce process that just makes it more acrimonious [and} tries to apportion blame in such a way that the couple are likely to have a weaker, poorer relationship subsequently than they would otherwise do." He stressed the new law will be introduced as soon as possible, "when parliamentary time allows". The changes follow the Supreme Court's rejection of a woman's appeal for divorce after her husband refused to agree a split. 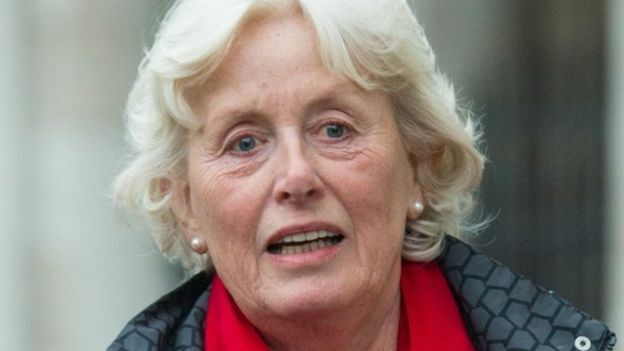 Tini Owens, 68, from Worcestershire, wants to divorce her husband of 40 years, on the grounds that she is unhappy. But husband Hugh refused to agree to it and the Supreme Court unanimously rejected her appeal. It means the couple must remain married until 2020. The UK's most senior judge, Baroness Hale - who is also one of the judges overseeing the case - has repeatedly called for the laws to be overhauled, describing them as "unjust". The new rules will include a minimum timeframe of six months from petition stage to decree absolute - the legal document that ends a marriage. At the end of this period the applicant will be required to continue to affirm their decision to seek a divorce before the divorce is granted. The government says this will give a "meaningful period of reflection" and the "opportunity to turn back". In addition, a new option will allow couples to apply for a divorce jointly. The introduction of a "no fault" system is huge. It represents the biggest change in divorce law in 50 years. Why has it happened? Because the current fault-based divorce system is now seen by many to exacerbate the stress and tension of an already highly stressful time. Critically it exposes children to the damaging impact of ongoing conflict between their parents both during the divorce and afterwards. While the wider family justice system attempts to help people to resolve issues in a non-confrontational way, the legal divorce process can make this more difficult because of the way it throws fault and blame into the mix when spouses are trying to end their relationship and make sensible living arrangements for their children. Under the current system, parents who need to continue to work together in their children's best interests can struggle to overcome feelings of hostility and bitterness caused by the use of the "fault" simply to satisfy a legal process. Fault, blame and having to prove two or five years separation were not seen to be helping couples move on with their lives - and that's why they are being consigned to legal history. The plans come after a 12-week public consultation which showed widespread support for no-fault divorce. Mr Gauke said overhauling divorce law could help prevent conflict between parents, which in turn risk damaging their children's futures. 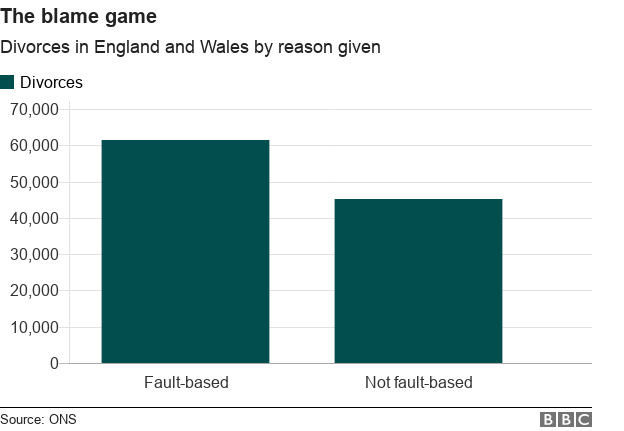 The blame element can cause "incredible animosity" between separating parents, Aidan Jones, chief executive of the charity Relate, told BBC News. He said: "That's what can cause difficultly for the children but also it can cause difficulty for the parents themselves, so anything we can do to reduce that is, I think, incredibly important." Divorce lawyer Zahra Pabani, family partner at Shakespeare Martineau, welcomed the announcement and called on the government to help move family law "into the 21st Century". "The wounds of divorce aren't only felt by the separating couple, but also by their children and wider family," she said. "This firm commitment by the government to help end the mud-slinging process that divorce so often becomes is long overdue." Amelia Jacob, who is currently going through a divorce, responded to critics of the planned changes, saying she could not see how making divorce less antagonistic would cause a "more relaxed attitude" to marriage. She told BBC Radio 5live: "There's an imbalance between how easy it is to get married and how hard it is to get divorced that probably needs to be looked at. "I don't think anyone sits down and thinks 'oh well, I guess it's not worked out so we'll just chuck it all away'." In Scotland, simplified divorce procedure is available to couples without children of the marriage under 16, where people can prove their marriage is broken down. This can happen with one year's separation, with the consent of both partners, or two years separation without consent. 2) One partner has an interim gender recognition certificate - issued to a transsexual person who is starting the legal process of recognition of their acquired gender.